I kept all the wiring the same colours as shown on the wiring diagrams and with all the correct plugs (I didn't want to use any crimp terminals). This means that it is hopefully quite difficult to spot that all these things have been retrofitted and also it is easy for me to find any faults in the future. Autocheck alone took a whole day to fit as it was not just a case of fitting the new wiring but I had to change the existing minicheck wiring as well. I also had to change the washer bottle pump and fit the 2 bulb monitors. A lot of things required quite large amounts of wire to be carefully routed, although it took me over a week from start to finish nothing was too difficult once all the interior was out. Most the parts I managed to get reasonably cheaply the cruise control for example only cost me £20. The rev counter here is in fact a V6 one with the S2 face, I couldn't live with using a 5 cylinder one and it being completely wrong. I also made sure I got an ABY speedometer as it uses the same number of impulses per mile as my original, all I had to do was add 98000 miles to it. Not a single switch blank! Thanks to Mike for the excellent s2-audi.co.uk, the wiring diagrams on there were a huge help to me. Obviously I can't list how I fitted everything here as this post is far too long already but I will happily help anyone who wants some advice, I have quite a few more pictures if they're any help. Excellent - well done you!!! That was some effort but obviously worth it!! I've got nothing but admiration for you, mine's a bit short of extras too, I would love to put the on board computer into her. I also like the grille, well smart! Join the audi owners club and your journey to the dark side will be complete! Well on you! Absolutely fantastic the work you have done, I probably would have panicked looking at all the wiring. I am curious though to see how involved it is to convert manual sunroof to electric? I would love to put the on board computer into her. I have a spare V6 on board computer with minicheck if you're interested. I paid £59 for it earlier this year from 4ring spares but I'll sell it for £50 plus postage. I don't have the loom or stalk unfortunately but I can tell you the part numbers for making your own loom and should be able to supply the correct colour wires if you want. The stalks for coupes are quite common so you won't have much trouble finding one. It isn't at all difficult to install as there is very little to wire up. It is not difficult at all, you only need to run one wire. The mountings for the motor are just the same as those for the winder although you do need to put 1 extra screw in. There is a single green plug under the dash panel which is the power supply for the motor, connect the new wire to this then remove the A pillar trim and feed the wire up and through the headlining. The earth point is already built into the roof, you just need a short bolt (M6 I think) to attach the earth terminal. You also need 2 single connectors and terminals, the correct ones are really expensive (about £5 each) from Audi but you could cut the existing ones off the loom on the motor and under the dash and use crimp terminals to keep the cost down or get the cable with terminals on it from a breakers. All the parts need to come from an B4 Audi 80 saloon as otherwise they will either not fit of they will be the wrong colour. Are those s2 aux gauges? Been interested to put some in mine as well. As I have been told, it's a draw of a hat if your wiring looms for it are present or not. Also did you retrofit the cig lighter by the diff light when you put the aux gauges in or was it already there? 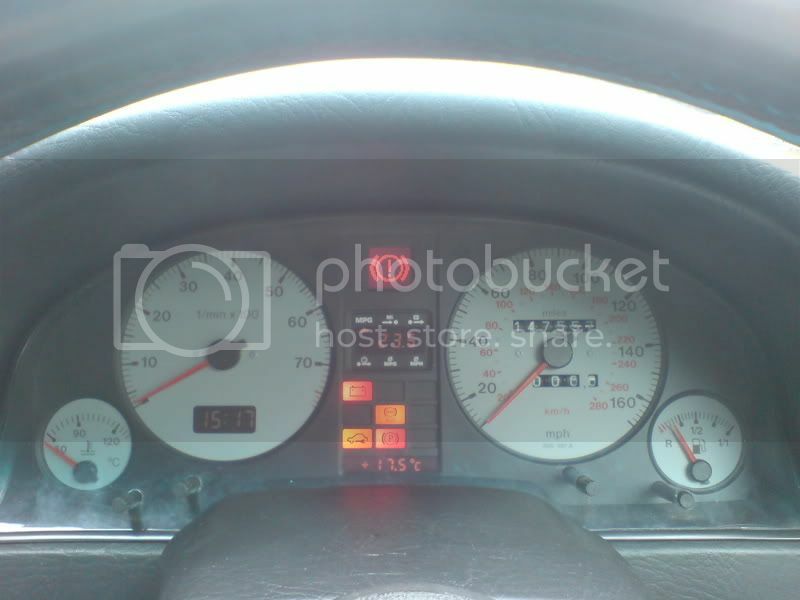 also on my tachometer, redline starts at 6300rpm, yours seem to start around 7k, or is that just the pic? Yes they are S2 gauges, I had the black faced ones from a CQ fitted before I decided to go for S2 instruments, they work just the same. I am almost certain you will have half the wiring you need to fit those gauges. If you remove the centre console you will find a 2 pin beige connector which isn't connected to anything, this is the signal for the oil pressure gauge and the oil temperature gauge. The good news is the oil temp sender is already in place and all wired up just to prevent there from being a hole in the block but you will need to get the 2 pin oil pressure sender and replace the existing one. You will need to run switched power and instrument lighting as well as changing the wiring already there to allow for the new position of the cigarette lighter. You will also need the gauge loom as well. I had to change both sections of the centre console when I fitted the gauges, the front section has a different ashtray and the rear one has the cigarette lighter, you could drill a hole in your current centre console and fit the lighter from your existing ashtray. I did this at first but it caused 2 problems, the terminals on the bottom of the lighter were angled and made it difficult to refit the console also you can't make it light up. I ended up getting both sections from an S2 that was being broken as they all have this arrangement as standard. nice nice work. maybe a longer version for the audience magazine? 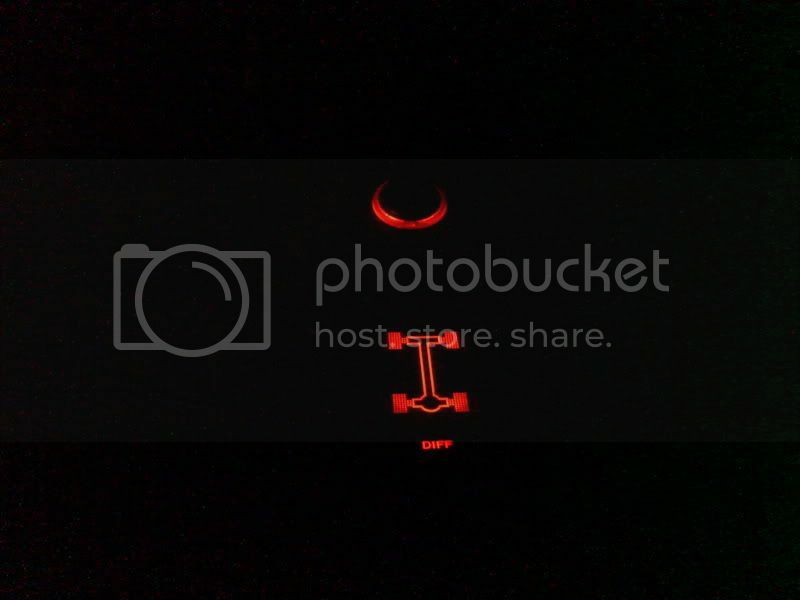 have you uprated the lights to projectors as well? Are they S2 or another variety. The wheels are made by 100+ but that's all I know, they were on the car when I bought it. They are 7Jx17 I have just put 4 225/45/17 Goodyear eagle F1s on them. I do quite like the wheels but I'm waiting until I get some 5x112 hubs to change to some more standard looking ones. I'm thinking of going for something like RS4 style. The headlights are ellipsoid ones just the same as those fitted to the RS2 and late S2. I bought them brand new from VAG Parts a few months ago as my old headlights had got so bad I could hardly see where I was going at night. They cost me almost £400 but I understand they cost even more now so I was probably lucky to get them at that price. So are we going to see your pride & joy at the Castle Combe events now? August 11th for starters - see the Events section for details. Hope to see you there. Good on you though as it looks great !!! I may well fit HIDs in the future, they would look excellent with the projector lights. I have spent so much time and money on this car in the last few months that I am going to try and leave it alone for the next year or so and use it for what I bought it for, reliable daily transport. I really want to concentrate on my mini for a bit, I started to build an engine for it 18 months ago and then had to spend almost £500 on the Audi so it has been on hold ever since. Anyway, I do have plans for the future for the Audi. I am looking to build a RHD S2 saloon as close as possible to how one would have been if Audi had built it. When I do this I will be looking to sell the wheels (as well as the engine, gearbox and rear diff) but this won't be for a while yet as I can't see it being a cheap project. The wheels are similar to the one in the picture but the spokes are a little different. The on board computer was one of the things I really wanted but now I have it it is almost always depressing, I did 0-100 earlier today and it was showing 7.2mpg, even cruising at ~80 I can only get about 26mpg. I have remembered I also fitted a pollen filter (I had a foliage grille before) and indicators that flash 3 times when you contact them briefly. The pollen filter was so easy and cheap to do and I can park under a tree now without my car filling with bits when I put the heater on. The indicators are nice to have on the motorway as well. Wow that is absolutely awe inspiring stuff. Probably the best 80 around. With regards to the fuel consumption, ignorance is bliss . Stop tempting me, I've spent more than I can reasonably justify already! They do look good though. you want HID lights.. woooooo go on! sell the mini to get them.. Tell you what though the Phillips 50% brighter bulbs for projectors (into the A6) they actually are 50% brighter. Impressed. if only the B4's were as brights as they should be. However that said i must say your 80q does look nice, purdy.. panther balck as well is it? MPG.. i get 390-400 out of a tank every week. which is about 28mpg or thereabouts. The gearing doesn't lend itself to cruising at 80. the V6 really should have go the 6 speed box. Don't think I will be selling the mini, it's nice to have a project and it will be good once it has a decent engine, I currently have an almost standard 998cc engine which has only covered 66k miles, it has low compression, especially on cylinders 1 and 4 and the oil pressure is slowly falling away. Still probably what I should expect from something built by Rover. It is also impressively slow for a 630kg car (probably a lot less now so much has rusted away). 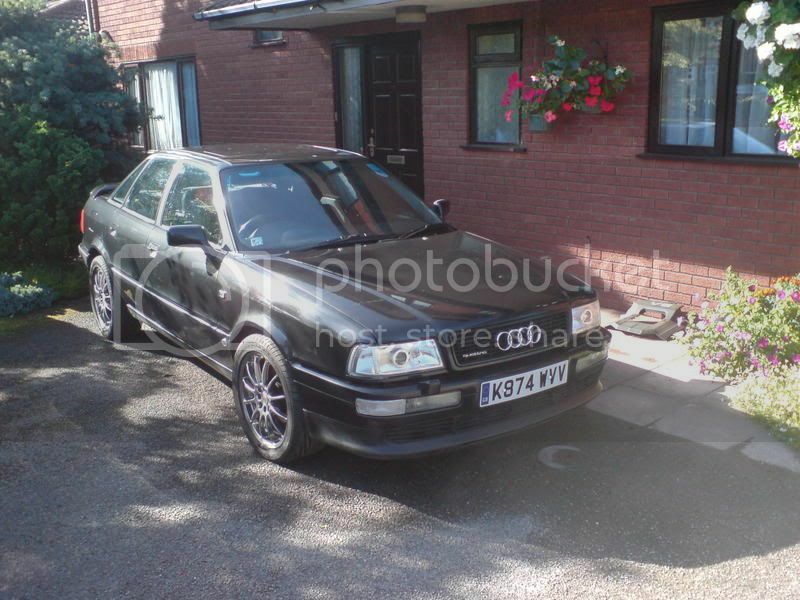 Could I build a 2.8 quattro mini and convert the Audi to a 20VT? Anyway, I am really starting to digress here. I haven't used the ellipsoids at night yet but they have got to be better than my old headlights, I might fit some 50% brighter bulbs if the standard ones aren't good enough, I have 6 50% brighter bulbs in the mini as I have 4 spotlights and that's bright, problem is it doesn't go fast enough to ever need them! I did look into fitting a 6 speed box from an S2 to my engine, the mounts line up with the subframe and I think it fits straight onto the engine. I would have to change the prop as it's shorter and rear diff as the ratio is different. However, I found the revs at 80 were so similar to my current box with the S2 ratios that there was no point. I also looked into fitting the 6 speed box from a C4 A6 2.5TDI Quattro but the ratios in that are far too high, it gave a theoretical top speed of 208mph! I still have the comparison between the standard box and the S2 one if you want to see. I did once get 34.2mpg from a tank, that was doing 50mph through the Czech republic and Poland for about 7 hours solid. It is Panther black, well spotted! 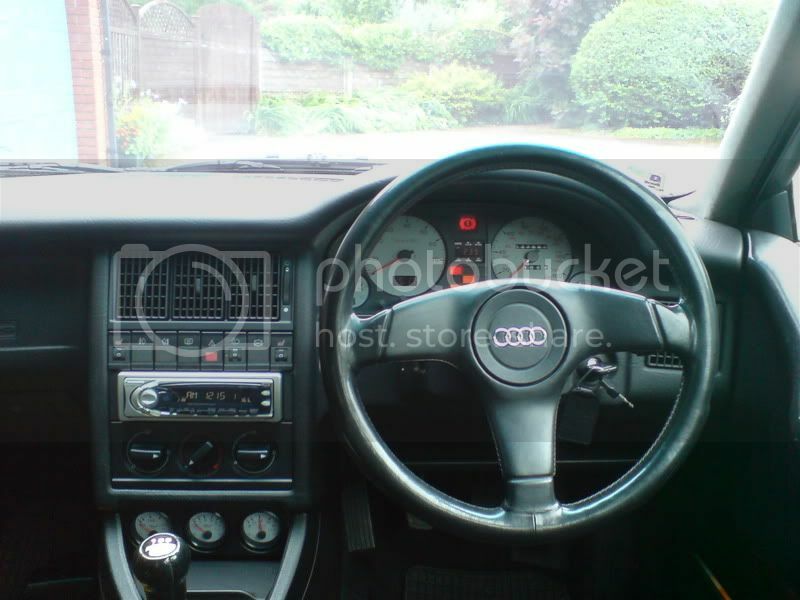 Could those modifications you fitted, be fitted to a Diesel 1.0 tdi Audi 80 ???? Some very nice additions you've made to the car, some of which I plan on doing myslef some time in the future. Can you share the details of what relay you used for the 3 flash inidcator and tell me a lillte bit about how you wired it please? Is the relay from the VAG parts bin and is it a direct plug in replacement for the original item or do you need to perform a little wiring surgery? Is the pollen filter a drop in replacement too? It would be just as possible to fit them to any model, I do however have a feeling that the cruise control and on board computer work a little differently on the diesel. Can you share the details of what relay you used for the 3 flash inidcator and tell me a lillte bit about how you wired it please? The 3 flash relay is intended for the golf, it has to be wired in but it isn't difficult. The only thing is you can't go by the colour of the wires as it shows in the instructions as they are different to the Audi ones. It didn't take me long to work out what to wire it to as the terminal numbers are the same as Audi ones but if you buy the kit I will let you know what colour wires you should join it to. You keep the original flasher relay, The 3 flash one can be clipped into a spare space on your aux relay carrier. The part number is 000 998 229. You need 3 parts to fit the pollen filter, the housing (8A0 819 441 A), gasket (8A0 819 165) and the filter(8A0 819 439). It is really easy to fit. Oh and A Pollen filter !!!
. You keep the original flasher relay, The 3 flash one can be clipped into a spare space on your aux relay carrier. The part number is 000 998 229. 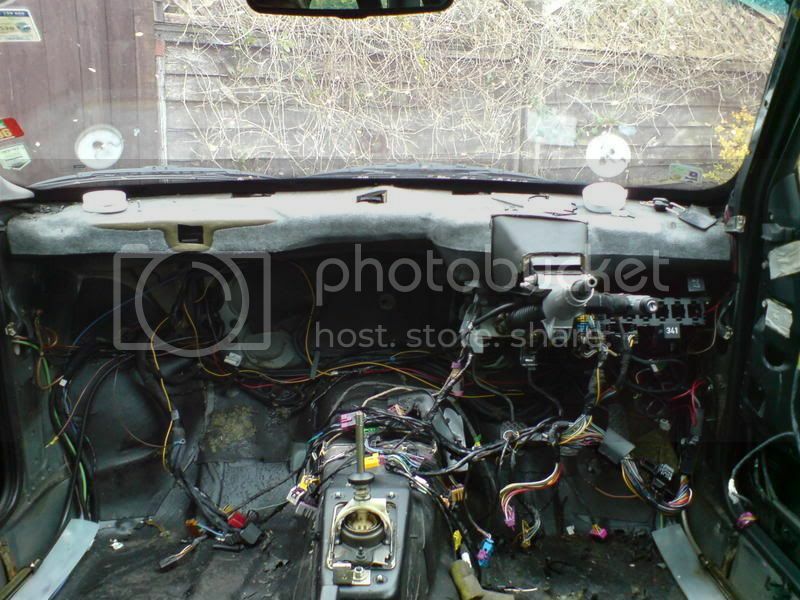 For terminals 1 and 3-5 you can find all the wires you need to splice into in the dashboard wiring loom, you would probably have to unscrew the conduit under the dash to get to them. You have to run a wire along to the top left of the bulkhead and then down to the left headlight where there is a bracket for the temperature sensor, you will also have to earth the sensor. Do you mean fitting HIDs to your current lights or fitting them to projector lights? I would not advise fitting them to reflector headlights as I know people have had problems with this. If you want to fit projector headlights and then convert them to HID it is going to be expensive. You would have to change the bumper trims and move your indicators to the bumper and you would have to fit fog lights. You would then have to buy the projector lights ~£250 second hand or £450 new and the HID kit which would be about £200 for a decent one. The only things you have to wire up on this are the fuel consumption signal and the stalk, 5 wires in total. The problem is I have no information on the 1Z ecu so I don't know where you get the fuel consumption signal from. I have seen them fitted to diesels so it is possible. Pollen filter is really simple, buy the 3 part numbers I gave Nuvo, remove the foliage grille and unbolt the housing, then replace with the new parts. That is all the same as I did it except the switched live. On the diagram that comes with the kit it shows terminal 15 rather than 49 so I used the black/blue wire. The only difference if you used the red and black wire is that they would work with the ignition in position 1 and 2 whereas mine only work with it on 2. Hi, thanks for the reply. Terminal 15 is on the ignition key switch right? According to my diagram that's a black wire. What diagram are you referring to ? Do you have a link maybe? The diagrams I am using are from the Haynes manual and are somewhat generic. Terminal probably wasn't the right word for it. The black wire from the ignition switch makes a contact in the fuse box (15) live, this makes quite a few terminals on the fuse box live . Don't use the black one from the ignition switch as it won't be fused, the most common wire running off this is the black and blue one so that is what I used, it is on the same fuse as the aux gauges and switch lighting etc. I am using a pdf of the Audi current flow diagrams but they are all in German. Ah okay, looking at the fog lights diagram I now see fuse S12 (15A) is connected to C15a of the fuse box via a black/blue wire. Thanks for your help! That's right, C15a is the one I used. Just spotted this thread. Full of admiration, as it must have in volved a lot of time to do. It reminds me of my G Plate Alpine white 90 quattro 20V I had many a year ago. Only options it had were the Speedlines and elec sunroof. At the other end of the scale my J Plate Panther 90 quattro Sport 20V had the following options, Rear Elec Windows, Elec Sunroof, Air Con (still ice cold),Rear Sunblind, On board Computer, Outside Temp Guage, Cassete Holder, 3 Spoke Sport Wheel, Factory Alarm, Illuminated Vanity Mirror, Heated Seats and Blaupunkt Canberra Radio/cassette and 10 Disc Changer. According to the Brochure for it, the only option it hasn't got is the tow bar. Probably not a surprise to say it was a VAG car when new. Also cost £27k and seriously close to S2 money at the time. No wonder only 92 hit the shores here. The best one I have ever seen, and I have owned several 90 Sports.